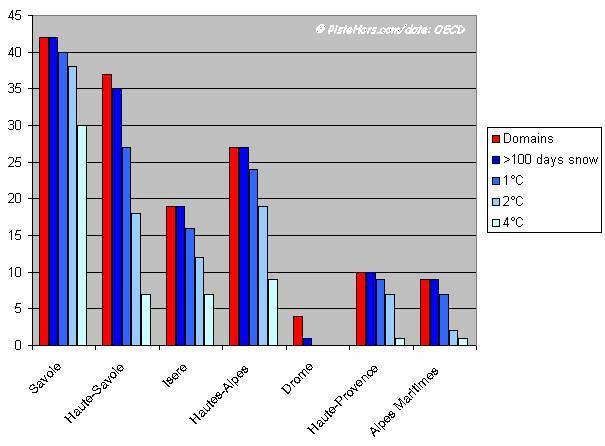 The winter of 2007 has been one of the hottest on record in France with temperatures 3° to 4°C above average in some areas. The warm period began in the middle of March 2006 with only a couple of cold snaps at the start of June and August. The summer was sweltering, nearly as hot as the 2003 heatwave that killed an estimated 15,000 people. Although the last couple of weeks have finally seen some weather fronts move across France, especially the Western Pyrenees, Northern and Hautes Alps the snow line has fluctuated between 1000-2400 meters and snow levels have not improved dramatically. In the Pyrénées the situation has not improved much except in the Western Pyrenees which saw a good 30 cm of new snow albeit from a pretty poor base. You have to climb to 2500 m before depths exceed 1m and then only in the western end of the mountain range. The Jura, Vosges and Massif-Central have all been struggling with patchy snow cover except on very sheltered slopes. Snow depths are just 50% of the long term average between 1500-1800 meters. Conditions only really return to normal above 2000 meters. The French capital, Paris has had only 5 days of frost this winter against 23 last year with 40 days above 10°C; 4 times more than average. It has certainly been good for the terraces of the city’s cafes even if shops are left with mountains of winter clothes. One might have expected the high altitude ski resorts to have done rather well but reservations are down overall: 50% in low and mid-mountain resorts and 10% in high altitude resorts. A spokeman for Salewa told us that sales of skis were also way down, people not wishing to risk new kit in the rocky conditions although sales of other gear have generally held up well. Dry and warm starts to the ski season are not unusual but this winter has proved exceptional in terms of the duration of the warm period. Early autumn has effectively segued into Spring without passing through winter. In the Oisans snow cover is 35% of normal at 1600m. Meteo France, which maintains a research laboratory at the Col du Porte, says the the current situation is similar to those of 89/90, 92/93 and 00/01; all very poor seasons. Some people have blamed the el-Nino effect. What is sure is that south-west winds have dominated keeping temperatures higher than trend. The snowline in the Alps is usually around 1200 meters in the Northern Alps, this winter it has been closer to 1800 meters. It should be remembered that we have just had two snowy and cold winters. Records were broken in Corsica, the Massif Central, Jura and the Vosges. 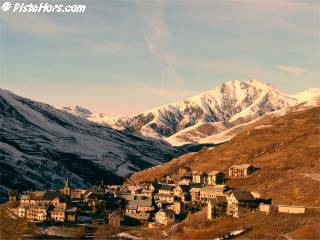 The Pyrenees have had 5 good seasons which has encouraged investment in the lift system and snow making. The severe 2006 winter at mid-mountain altitudes disrupted transport links and led to a shortage of road salt. The Vosges had close to 3 meters of snow on the summits and people were still skiing in June. At le Mont Dore the ski lifts operated until early May, something rarely seen in the region. In contrast this winter has been the worst for 30 years with resorts struggling to operate normally. Snow cannons have saved the winter for some resorts however they require cold temperatures and a supply of water to run. The Pyrenees and Southern Alps are in the grip of a drought. The Ariege, which flows from Andorra is at just 40% of its normal level. The lowest since 1925. The Canal du Midi is not navigable due to lack of water and the Garonne is at half its usual level. The French electricity company has not been able to run its hydroelectric plants in the region. The Pyrenean resorts had prided themselves on “ecological artificial snow” but there has not been enough hydro-power to supply the snow cannons. Resorts are taking action. Gilbert Blanc-Tailleur, mayor of Courchevel says that “all people who earn their living from the mountains have known winters with a lack of snow”. He sees the answer in artificial snow stating that “French resorts are now leaders in snow cannons having accelerated investments recently.” Le Grand Bornand in the Aravis mountains is buiding a 300,000 meter cubed reservoir, due to be finished this summer. The investment is costing 5 million euros and will supply snow cannons that will cover a whopping 60% of the ski area with 1,200 m3 of water per hour. The largest system in France. André Pérrillat, mayor of Grand Bornand, says that “artificial snow is a necessity for the economic life of a vast region”. He claims that the reservoir is a real lake integrated with the environment and not “a hole in the ground with a plastic liner”. Tignes, which has stopped opening year round since 2000 due to the shrinkage of its glacier, is building snow fences similar to those found in Scottish ski areas to retain snow. The glacier is currently receding at a rate of 2 meters per year. Snow is being stocked in mounds ready for the summer and the drag lifts on the Grande Motte glacier are being shortened and moved higher this season. 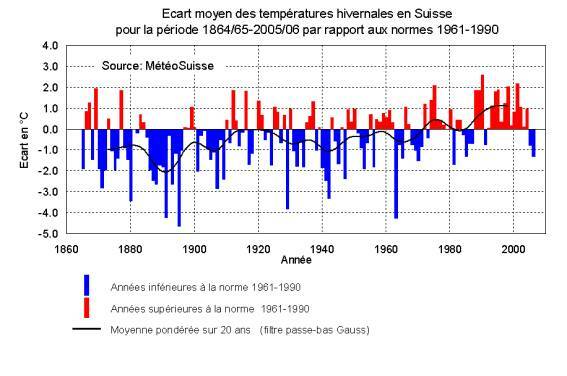 Over the last 100 years warming in the Alps has been 3 times faster than the national average. A French government report suggests moving the focus away from the product of downhill skiing. Vincent Rolland, a Member of Parliament for the Savoie, says that ski resorts are “in the front line of the fight against climate change”. He thinks alpine skiing is too elitist and wants resorts to sell the mountain as a whole and to address other markets and clientele with walking, family holidays, local products. However he admits than skiing will remain the core activity. Blanc-Tailleur says that French resorts are at least a dozen years behind their counterparts in Austria and Switzerland and see the future in developing marked walking trails, spas, water and health centers. A recent report by the OECD (Organisation for Economic Co-operation and Development) has given French ski areas more food for thought. The previous decade has seen 4 of the hottest years in the alps (1994, 2000, 2002, 2004) since the middle ages with 2007 looking to confirm the trend. The report claims that the Alps and their economy is very sensitive to climate change and the consequences could vary dramatically from one region to another. The table illustrates the situation for the French Alps and shows what would happen to the number of viable ski areas (more than 100 days snow cover on average) with a temperature rise of +1C, +2C and +4C. Meteo France has just published its conclusions about the three months from December to February which it says were the “mildest since accurate and widespread readings began in France in 1950”. Temperatures were “2.1 °C above the long term average taken from 1971-2000” with Janaury and February both more than 3.0 °C above trend. December was cooler, +0.4°C more than trend. January was just behind 1988 (+3.1 °C) and February in 5th place behind 1990 (+4.5 °C), 1966 (+3.5 °C), 1995 (+3.2 °C) and 2002 (+3.1 °C). What has been significant is the length of the mild weather which follows the hottest autumn on record and a heatwave over the summer of 2006. France only saw “a couple of periods of relative cold during the second half of December and the last week of January”. Records for warmth were broken on the 18-19th of January. There were regional differences. The North of France saw the warmest temperatures, it was cooler in the south-west. 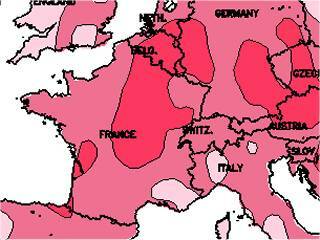 Meteo France say spring will probably continue the warm trend.